To get a FREE trial subscription or to learn more about our products and services, please fill out the brief form below, or call our Customer Service Department at 1-800-771-9202 or 1-202-872-9200. In the United States please call 800-771-9202 or 1-202-872-9200 between 9 a.m. and 5 p.m. EST to obtain expedited Customer Service. During other hours you may leave a voice message with your name, your company, phone number and your question. If you wish to place an order please indicate the product. A Customer Service Representative will return your call within 2 business days. Please fax us 202-318-8350 twenty-four hours a day. Be sure to indicate your name, company, email address, phone and fax numbers along with your question. If you wish to place an order, please indicate the product and method of payment. 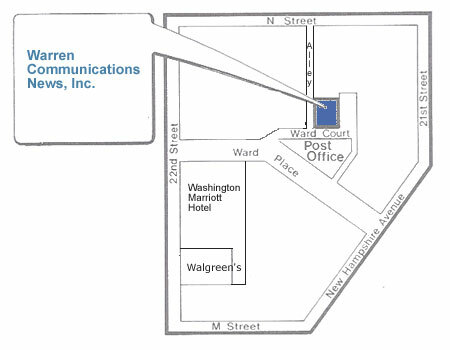 Our office is located in Downtown Washington, D.C. in the West End District.